Emergency Services throughout Australia including Police Departments, Ambulance Services, Fire Authorities, Health Departments & Rescue Organizations are showing a growing interest in the safety advantages of operating helicopters at night aided by the latest generation of Night Vision Goggles. As the first CASA (and USA State Department), approved NVG Advance Flying Academy in Australia, Rotor-Lift is firmly established as the leader in NVG flight training for both pilots and air crewmen. 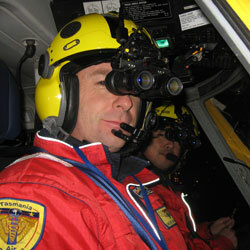 Since the inception of NVG operations in November 2007, Rotor-Lift’s Tasmanian Air Rescue Helicopter has numerous missions to its credit where the use of NVG’s have saved many man hours in search and rescue situations, in particular where the weather would have otherwise prevented the rescue from taking place during the hours of darkness. Read more in this article from HELINEWS.